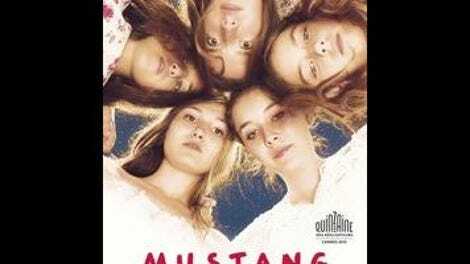 Given that Mustang is a story about five sisters, clustered together in age and collectively going through puberty and/or adolescence, all of whom are imprisoned (literally, in this case) by authoritarian relatives, one could be forgiven for assuming that the film must be a Turkish remake of Sofia Coppola’s The Virgin Suicides (itself adapted from the novel by Jeffrey Eugenides). As it turns out, there’s no connection, apart from that basic narrative similarity. Rather than a gauzy reflection of the past, filtered through the wistful memories of young men, Deniz Gamze Ergüven’s feature debut (co-written with Alice Winocour, director of Augustine and the forthcoming Disorder) focuses entirely on the girls, in the present tense. The result, while less poetic and artful than Eugenides’ book or Coppola’s film, is much more emotionally direct, and pulls off a very tricky balancing act between bemoaning its characters’ fate and celebrating their resilience. At first, Mustang seems too much weighted in the former direction. For an American audience, at least, there’s no equivalent of Kirsten Dunst among the cast, and the sisters—Lale (Günes Sensoy), Nur (Doga Zeynep Doguslu), Ece (Elit Iscan), Selma (Tugba Sunguroglu), and Sonay (Ilayda Akdogan)—tend to function as if they’re a single collective organism, manic and undifferentiated, rather than as five individuals with distinct personalities and desires. After a nosy neighbor witnesses the girls innocently riding the shoulders of some boys, however, their uncle (Ayberk Pekcan) and grandmother (Nihal G. Koldas), acting as guardians since the death of their parents, confine them to the house, eventually going so far as to bar all the windows. Meanwhile, arrangements are made to start marrying them off, one by one. Combined with the somewhat generic characterization, this increasingly makes Mustang feel like a domestic horror movie in which patriarchy is the implacable serial killer, severing the jugular vein of each girl’s spirit. As the film’s symbolic title suggests, though, it’s not quite that easy. Ergüven doesn’t downplay the hardships (which range from stifling boredom to sexual abuse), but she’s equally invested in the occasional surges of heady liberation, as when the sisters manage to escape and head for a soccer game. A lot of Mustang, in fact, plays like a prison movie with a spiky sense of humor, especially as the sisters who get married disappear and the youngest, Lale, increasingly takes center stage. Toward the end, as she and her last remaining sister make their final break, it becomes clear that Lale has a specific destination in mind, but there’s no indication as to what it might be—everyone she knows, it seems, is either one of her oppressors or equally oppressed. So much energy gets directed into sexualizing these children against their will that nobody pays any attention to what they actually value. The answer, when it comes, is at once so unexpected, and so retroactively obvious, that it’s downright shattering.